China's mobile maker Xiaomi launched its first gaming smartphone Black Shark in April. Xiaomi is now working on the Black Shark Upgrade Version Black Shark 2. The model number AWM-AO of Black Shark2 has been listed on China's Certification Website TENAA. Compared to the old model, there will be changes in the design of Black Shark 2. There was the horizontal camera set up on the back panel of the Black Shark model, but its upgrade version has got a glimpse of vertical rear camera setup. Fingerprint sensor was given to the front panel of the first gaming smartphone of Xiaomi, but the fingerprint sensor appears on the back panel in the picture of the new model that was revealed on Tina. In China, the initial price of black shark is 2,999 Chinese yuan (about 31,700 rupees). The initial price of Black Shark 2 can also be around it. According to Tina's listing in SlashLeaks's report, the 5.99-inch display in Black Shark 2 can come with full HD + resolution. Like the previous model, Black Shark 2 also has 4,000 mAh batteries for power backup. The length of the phone can be 160x75.26x8.7 millimeters. This means that Black Shark 2 will be lighter than the previous model. Four photos of the new smartphone from Tina site have been posted on Slashdot. Seeing the side view of the new model, this handset looks similar to the previous model. However, some changes have been made to the back panel, such as with the vertical dual rear camera setup in Black Shark 2, you will get a fingerprint sensor. The phone's front panel plane is due to the fingerprint sensor being on the back panel. Black Shark and S logo will be seen in the bottom of the back panel. However, there is not much information about the new smartphone yet. Please note that while writing the story, no record was found on clicking on the TENAA listing link on slashcricks. 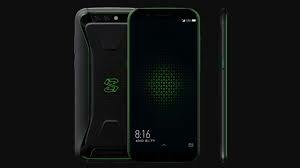 The Black Shark 2 smartphone can come with Qualcomm Snapdragon 845 processor and 8 GB RAM. The graphics can be used in the handset for the Adreno 630 GPU. This smartphone can be equipped with Liquid Cooling Technology for the better gaming experience. The price and availability of Black Shark 2 are yet to release the curtain. In the coming time, more information regarding Black Shark 2 is expected to be available on the website Tina.